What is responsible whale watching? Click on one of the icons to the right to reveal a full description of the species with photos and labeled illustrations useful for species identification, as well as information on biology, ecology and conservation status of each species. 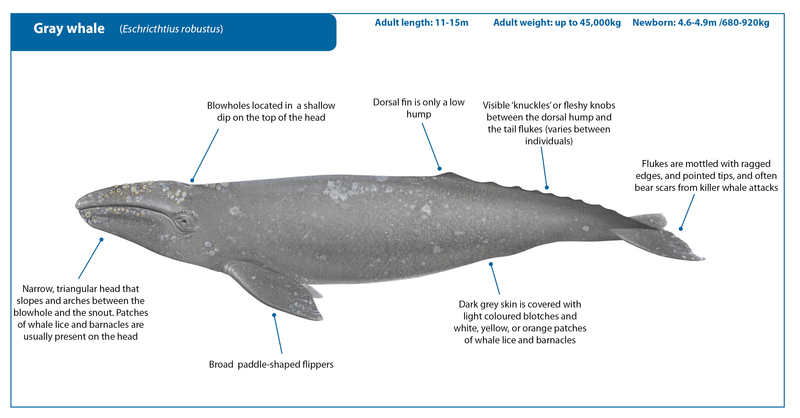 Click here to find downloadable PDF fact sheets for each of the species featured on this site. Explore this section to find links to downloadable PDF reports, species ID guides, a table of guidelines and regulations from around the world, a glossary of whale-watching terms, and a fully searchable database of over 300 reports and peer-reviewed articles on whale watching. This Handbook is designed to support managers, regulators, operators and anyone interested in whale watching. It is a flexible and evolving tool incorporating international best practice, educational resources and a summary of the latest, relevant scientific information. Content has been drafted and sourced in consultation with IWC and CMS affiliated scientists and managers from around the world, and is reviewed each year at the meeting of the Scientific Committee of the International Whaling Commission. Some of the first whale watching tours ever to have been offered focused on gray whales along the coast of southern California. Found close to shore, and often curious around boats, the species is well-loved by whale watchers up and down the west coasts of Canada, the United States and Mexico. Here, in the eastern part of its range, the species seems to have recovered after protection from whaling. 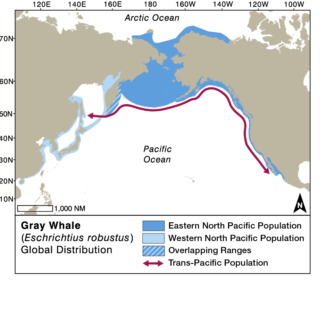 However, the western gray whale subpopulation that feeds near Russia’s Sakhalin Island and Kamchatka Peninsula in the eastern Pacific is one of the smallest whale populations in the world. Gray whale spy hopping in San Ignacio, Mexico. Photo courtesy of Chris Johnson. Gray whales, when seen clearly, are easily distinguished from most other species of whale by their unique mottled colouring, dorsal hump and knuckled dorsal ridge behind the hump. Although they share habitat with humpback whales and sometimes sperm whales, both of which can have similarly small hump-like dorsal fins, those whales are much darker and more evenly coloured without the blotches and mottling typical of gray whales. North Pacific right whales are extremely rare but occasionally appear in the same areas as gray whales. Gray whales are found in coastal waters of the North Pacific. The greatest numbers occur along the west coast of Canada, the United States and Mexico, but small numbers are observed every year in near-shore waters of eastern Russia and Japan. Like most baleen whales, gray whales undertake seasonal migrations between summer and autumn feeding grounds and wintering grounds in southern latitudes. In the eastern Pacific, most gray whales feed in the Bering and Chukchi Seas, as well as the north Pacific coasts of Canada and the USA. These whales calve and mate off central and southern California, along the Baja California peninsula and in the Gulf of California. Their annual migration has been characterized as the longest recorded for any mammal – a round trip of up to 20,000km spanning up to 55 degrees of latitude1. Their migration route takes them close to shore along the west coasts of Mexico, California, Oregon, Washington, British Columbia and Alaska, where they can often be viewed from land, as well as from boats. For many years researchers believed that the small group of gray whales that feed in eastern Russia migrate south along the Asian coast to the historical wintering ground in southern China However, satellite tagging and photo-Identification studies have shown that many of those whales migrate across the Pacific Ocean to and from the wintering grounds in Mexico 2,3. 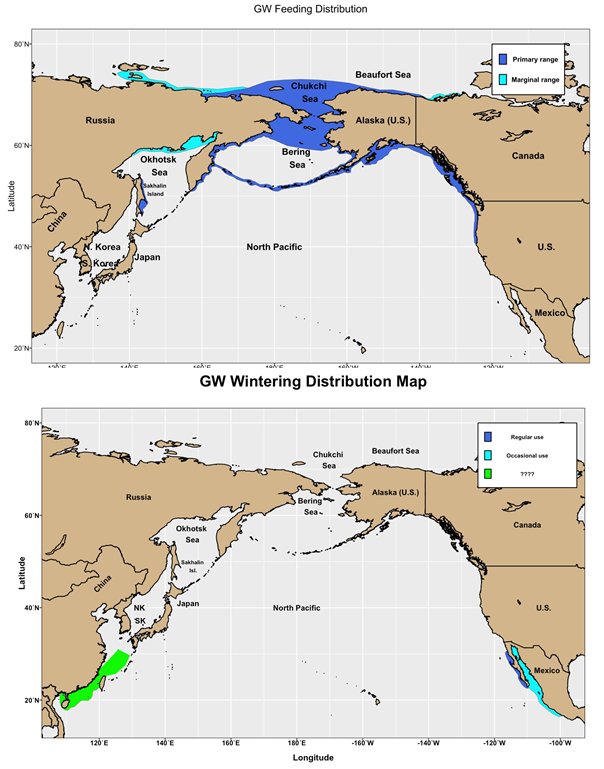 Feeding grounds (top) and wintering grounds of gray whales in the Pacific Ocean. IWC archives. 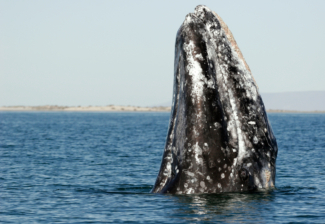 Gray whales feed on a variety of small crustaceans – including larval crabs and mysid shrimps4. 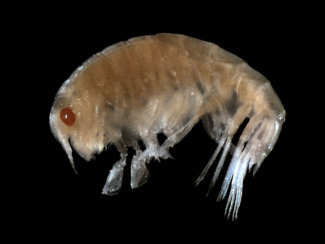 They have been documented to feed on small clams in shallow muddy bays, or fish larvae in the water column, but their most common prey are small flea-like crustaceans called amphipods. Gray whales can suction or skim feed in mid-water or near the surface but are mostly bottom feeders, where they find tube-dwelling and burrowing amphipods. Gray whales can leave excavated trails or furrows in the sediment where they have been feeding. A gray whale can eat as much as 1,200 kg of food a day1. Interestingly, over 90% of whales fitted with tags that measured their diving behaviour and orientation under water showed a preference for rolling onto their right sides while they feed5. Gray whales have a promiscuous mating system, with both males and females potentially mating with several partners in the same season. Mating begins in late autumn on the migration southward and continues on the winter calving and nursing grounds. After conception and a gestation period of 11 to 13 months, calves are born between late December and early March. Mothers and calves are tightly bonded for 7-8 months until the calf is weaned. During this time the calf will consume as much as 1800 litres of milk a day. With a 53% fat content and 6% protein, gray whale milk is richer than that of any other known whale or dolphin species. Mothers and calves remain close to shore during the northward migration (usually within 200m of the coast), possibly trying and avoid killer whale attack. Mothers are very protective, sometimes fighting to the death to thwart attacks on their calves. Genetic sampling and satellite telemetry (the attachment of small devices that send the whale’s geographical positions to satellite receivers) allow researchers to track whale movements and have been very important for understanding the possible connections between eastern and western gray whale populations2,6. More information about research techniques used to study whales and dolphins can be found here. The most frequent predators of gray whales, particularly calves, are killer whales. Many gray whales bear killer whale tooth rake scars and disfigurements on their bodies – particularly on their tail flukes. Attacks are not always fatal, but pods of killer whales regularly attack, kill and consume gray whales, especially calves, on migration as well as in summer feeding areas. 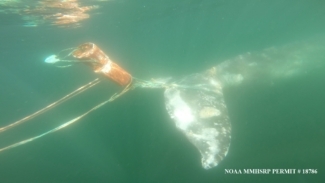 Like all whales and dolphins, gray whales are vulnerable to accidental entanglement in fishing gear. Western gray whale feeding grounds are also squarely situated in important oil and gas fields off the coast of Russia, and as such, there is great concern about the potential impacts of oil and gas exploration and production on the Sakhalin population. Although gray whales have been legally protected from commercial whaling since the moratorium established by the International Convention for the Regulation of Whaling, a limited catch of eastern gray whales by aboriginal communities for cultural and subsistence purposes is permitted. Most of these catches are made in Chukotka, Russian Federation, but a small portion of the IWC catch limit is allocated to the United States. The gray whale sub-population that feeds near Russia’s Sakhalin Island and Kamchatka Peninsula in the western Pacific is one of the smallest whale populations in the world. Intensively hunted in the first half of the 20th century, western gray whales are still listed by IUCN as Critically Endangered. Numbers off Sakhalin have slowly increased from an estimated 115 animals in 2004 to 174 in 20157. Although the increase gives cause for hope, the small number of reproductive females in the population, ongoing pressures from oil and gas development near their prime feeding grounds and the risk of entanglement or entrapment in fishing gear off Japan1 and elsewhere in Asia are of great concern for the eventual recovery of gray whales in the western Pacific. The eastern population appeared to recover relatively quickly after protection from commercial whaling. The population reached nearly 30,000 in 1997/98, but then dropped to roughly 18,000 following a mass mortality event in 2000-2002. Stranded and live whales observed at that time were alarmingly thin, and the mass die-off is thought to have been linked to food shortages resulting from a possibly climate –change related reduction in productivity on their feeding grounds1 or from unusual persistence of ice cover which prevented access to primary feeding grounds8. This population (which is taken to generally represent the species as a whole) is designated as Least Concern on the IUCN Red List of threatened species. 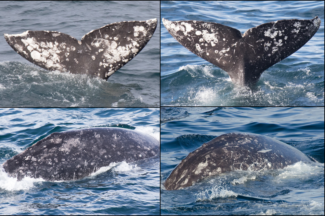 Individual gray whales can be recognised by the patterns and serrations on the trailing edges of their tail flukes or their flanks and dorsal humps through a process called photo-identification. Photo courtesy of IWC POWER. Gray whales were likely the very first species to be the focus of whale watching tours in the 1950’s when a fisherman in San Diego, California began to offer to take tourists out on his boat to see the whales for a fee of 1 dollar9. Today the species is one of the targets of whale watching tours up and down the west coasts of Canada, the United States and Mexico. Often called “the friendly whale” because individual whales can be curious and approach boats closely, it can be a rewarding species for tourists to watch. But this curiosity may also put the species at risk of injury from boat or propeller strikes. As with many other species of whale and dolphin, boat presence has been shown to change gray whales’ swimming direction and other behaviour10 – short-term effects with possible long-term impacts. As with all cetacean species, it is important that sensible guidelines are followed to limit the impacts of whale watching on the whales’ long term welfare and survival. Whale watchers with gray whale in San Ignacio, Mexico. Photo courtesy of Chris Johnson. Jones, M. L. & Swartz, S. in Encyclopedia of Marine Mammals (eds W. Perrin, B. Wursig, & J.G.M. Thewissen) 503-511 (Elsevier, 2009). Mate, B. R. et al. 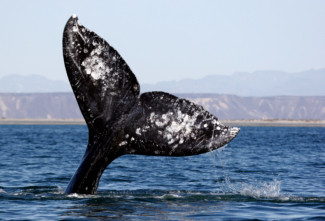 Critically endangered western gray whales migrate to the eastern North Pacific. Biology Letters 11, doi:10.1098/rsbl.2015.0071 (2015). Weller, D. W. et al. 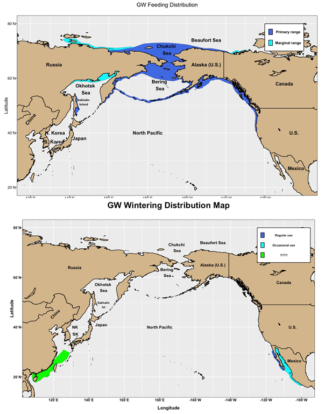 Movements of gray whales between the western and eastern North Pacific. Endangered Species Research 18, 193-199 (2012). Dunham, J. S. & Duffus, D. A. Foraging patterns of gray whales in central Clayoquot Sound, British Columbia, Canada Marine Ecology Progress Series 223, 299-310 (2001). Woodward, B. L. & Winn, J. P. Apparent Lateralized behaviour in Gray Whales feeding off the Central British Columbia coast. Marine Mammal Science 22, 64-73 (2006). LeDuc, R. G. et al. Genetic differences between western and eastern North Pacific gray whales (Eschrichtius robustus). Journal of Cetacean Research and Management 4, 1-5 (2002). Cooke, J. G. et al. Updated population assessment of the Sakhalin gray whale aggregation based on the Russia-US photoidentification study at Piltun, Sakhalin, 1994-2014. 11 (Western Gray Whale Advisory Panel Doc. WGWAP/16/17, 2015). Perryman, W. L., Donahue, M. A., Perkins, P. C. & Reilly, S. B. Gray whale calf production 1994-2000: Are observed fluctuations related to changes in seasonal ice cover? Marine Mammal Science 18, 121-144 (2002). Hoyt, E. Whale Watching 2001: Worldwide tourism numbers, expenditures and expanding socioeconomic benefits. 1-256 (International Fund For Animal Welfare, London, 2001). Heckel, G., Reilly, S. B., Sumich, J. L. & Espejel, I. 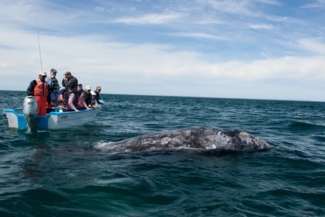 The influence of whalewatching on the behaviour of migrating gray whales (Eschrictius robustus) in Todos Santos Bay and surrounding waters, Baja California, Mexico. Journal of Cetacean Research and Management 3, 227-238 (2001).